Four years ago, Canton’s Drew Ambrose found himself at a crossroads in both his personal and professional lives. He decided that what he really wanted to do with the rest of his life was make music full-time. Local fans will be glad he did when they hear his debut CD, “Soul Shine.” The album blends various influences into a smooth pop/soul sound that seems tailor-made for adult contemporary radio. Ambrose will celebrate the CD’s release with three upcoming dates. He leads his septet at the Kirkland Cafe in Somerville tonight and at O’Brien’s in Allston tomorrow night. On July 12, the group will perform at the Midway Cafe in Jamaica Plain. 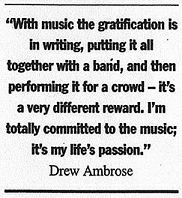 Unlike many dreamers who might want to be musicians, Ambrose had both a musical background and the resources to invest in himself. After majoring in business in college, Ambrose spent 17 years building a career in the business world. He was a partner in a company which supplied temporary help, such as software engineers, to high tech firms. That outfit became so successful a larger company made them a nice buyout offer, and while it afforded Ambrose a neat little nest egg, it also came with a three-year no-compete clause. He was only too happy to take a break from the corporate world. Ambrose’s influences are varied, but his favorite contemporary performer is Seal and that kind of melasmatic soul is very evident over the CD’s 46-minutes-plus length. There’s also a healthy infusion of rock and pop shadings, and many older fans will doubtless compare it to Hall and Oates’ best work. The soulful rock ballad “Never Have to Say Goodbye,” for instance, is better than anything Hall and Oats have released for a decade or so. Ambrose, who recorded the album with studio musicians, has assembled his own band and has been busy rehearsing them. John Hamill of Franklin is the bassist, with Leominster’s James Thomas on drums, Athol’s Kailte Kelly on keyboards, Somerville’s Dave St. Dennis on keyboards, Connecticut’s Chris Simonds on guitar, and Norwood’s Kathy Quinn on harmony vocals. Ambrose knew Quinn from working their previous day jobs, while Hamill was the bassist in The Core. Thomas, Kelly and St. Dennis were recruited from ads in the Boston Phoenix, and they referred Simonds. This band may be compiling lots of commuting mileage, but they all believe strongly in the final result. Ambrose and his fledgling band are planning a follow up CD, with sessions slated for mid-July. He hopes to have a three-song EP ready by summer’s end. The novice songwriter has become quite proficient. While Ambrose never rules out a return to the business world – and admits his entrepreneur dad doesn’t quit consider music a real job – he’s sure he’s made the right choice for a new direction.